Our study last week reminded me of something else that caught my eye while writing the minor prophets series last year. When I was copying verses over into my handwritten notes, I realized I was writing “the Lord of hosts” quite a lot — sometimes more than once in a single verse. You’ll often see this name of God written as “Jehovah Sabaoth.” Yahweh Sebaot/Tsebaoth are other ways to transliterate the name, and Elohim Sebaot is used as well. The variations of this name occur some 285 times, mostly in the books of prophecy. In the New Testament, it’s transliterated as “Lord of Sabaoth” (Rom. 9:29; James 5:4). Seeing the name “Lord of hosts” again and again in the prophets made me wonder about the significance of this name. Each name of God tells us something important about His character. What does “the Lord of Hosts” teach us? When the Lord is referred to as Yahweh Sabaoth, it speaks to His position as “head of all the armies in existence.” He leads the hosts of His people, controls the hosts of other armies, and is master of the heavenly hosts as well. This includes angel armies and heavenly bodies like the sun and moon (Theological Wordbook of the Old Testament). God’s promises are backed-up by the fact that He literally controls everything. The Theological Wordbook of the Old Testament notes that sabaoth refers to “Yahweh the mightiest Warrior or Yahweh the all-powerful King.” Yahweh Sabaoth is a name that speaks of His ultimate authority to command. The first time the name Yahweh Sabaoth appears in scripture is 1 Samuel 1, when Elkanah goes to sacrifice to the Lord of hosts (v. 3) and his wife prays to Yahweh for a child (v. 11). God as a Warrior shows up even earlier, though. He fought for Israel when delivering them from Egypt (Ex. 14:14), and Joshua’s encounter with a pre-incarnate Jesus Christ also alludes to this name of God. Before the first major battle Joshua was going into as Israel new leader, the Commander (H8269, Sar, also translated “captain” or “prince”) of the Lord’s host appears. As the Lord who fights for us, He came to tell Joshua there wouldn’t be a battle of the usual kind at Jericho. We all know the story of Jericho — how the warriors and priests, carrying the ark of the covenant, marched around the city six days, then on the seventh they shouted and the walls came tumbling down. Joshua’s command to the people on that last day was, “Shout, for the Lord has given you the city” (JOsh. 6:16). Israel won this battle by doing exactly what the Captain of the Lord’s hosts told them; a very evident reminder that their victories all came about because the Almighty was on their side. We don’t march into battle as a nation with God at our head anymore. In terms of the promises made in the Bible to God’s covenant people, Israel today exists on a spiritual level. What does the Lord of hosts fight for us if we’re not battling physical foes? If we look in the New Testament, the obvious answer is that our Yahweh Sabaoth is fighting spiritual battles. Paul tells Timothy to be “a good soldier of Jesus Christ” (2 Tim. 2:3-4), and includes us all as part of the lord’s host in describing Christians fighting battles alongside God. Only Yahweh Sabaoth can equip us to battle enemies like this, and He’s the only warrior mighty enough to ensure ultimate victory. 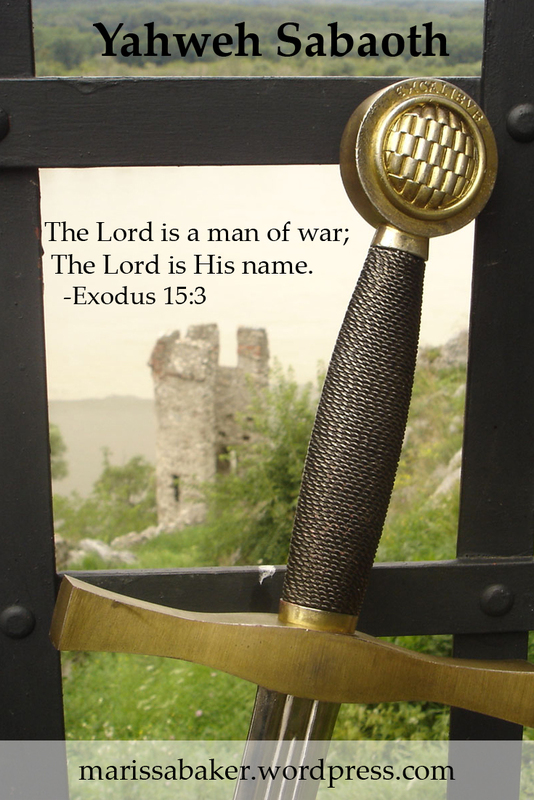 In addition, He fights for us on many battlefields we might consider “smaller” than spiritual warfare. Looking for examples of how the Lord of hosts fights for His people, we see both physical and spiritual intervention in the life of David. Facing Goliath, David said, “You come to me with a sword, with a spear, and with a javelin. But I come to you in the name of the Lord of hosts, the God of the armies of Israel, whom you have defied” (1 Sam. 17:45). We all know what happened to that giant, and David continued to have military and personal success because “the Lord God of hosts was with him” (2 Sam. 5:10). These words from God echo His assurance to Israel at the banks of the Red Sea — the Lord will fight for you, on many different battlefields. These can be external to us, and internal as well. David called out to the Lord God of hosts when his soul felt overwhelmed (Ps. 69:1, 6). Hannah asked the Lord of hosts to fight her battle against infertility (1 Sam. 1:11). God answered both prayers, and won both battles. Nothing His children are fighting is to insignificant for God to step in and do battle on our behalf as the mightiest Warrior and all-powerful King. I needed this so badly. My faith is growing, but it seems as though hell has been unleashed at my door step and I have been beaten down by so many different “events” in my life lately. I am learning to trust Yeshua, but I know that I have doubted that he would fight for me on any front. It always feels like I have been left to defend myself. So I am meditating on these truths you share and I pray I can see through all the struggles to letting go and knowing he will be my guardian and defender and avenger. I wish it wasn’t so challenging to believe. I love the story in Mark 9 where a father was asking Yeshua to heal his child and “cried out and said with tears, ‘Lord, I believe; help my unbelief! '” It reminds me that it’s okay to ask Yeshua for help even when what we’re fighting is our own struggle with faith.